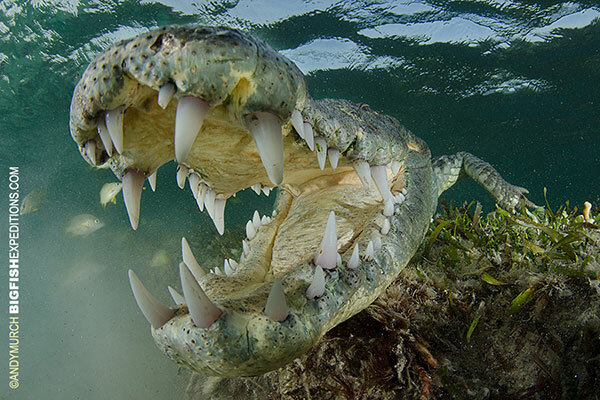 We have just completed two phenomenal back-to-back American crocodile expeditions to Banco Chinchorro in Southern Mexico. 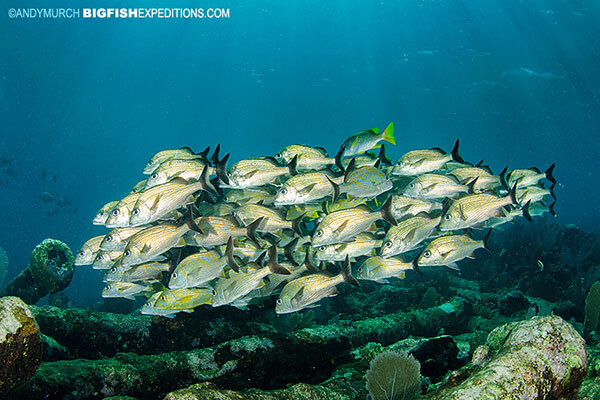 This was one of the most adventurous locations that Big Fish Expeditions has visited and it went off without a hitch. After picking up the guests in Cancun we drove down to Xcalak; a tiny village of around 250 people just north of the Belizian border. The next morning we made the crossing to Banco Chinchorro 30 miles offshore. Chinchorro is the largest atoll in the western hemisphere. As well as having world class reef diving, it is home to the densest population of crocodiles in the world with more than 700 animals living in a small shallow lagoon in the middle of the atoll. As soon as we arrived we strung our hammocks and settled into the primitive accommodation; a fisherman’s hut on stilts that I nicknamed the ‘Hotel Chinchorro’. While everyone adjusted to the concept of no running water or air conditioning for three days, the crew set about the business of chumming for crocodiles. Almost immediately, the first crocodile snaked its way towards the hut. After a quick briefing we slipped into the water two at a time and started snapping away. 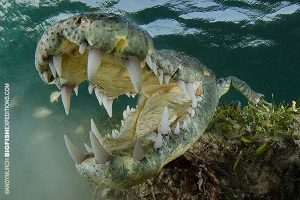 The crocodiles were absolutely captivating. 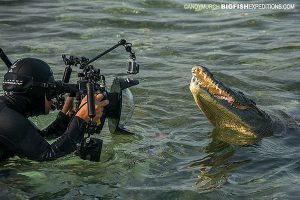 Everyone was a little cautious around them at first but before long we were so close that the crocs were practically nuzzling our cameras. The photographic opportunities were unbelievable and so were some of the resulting images! 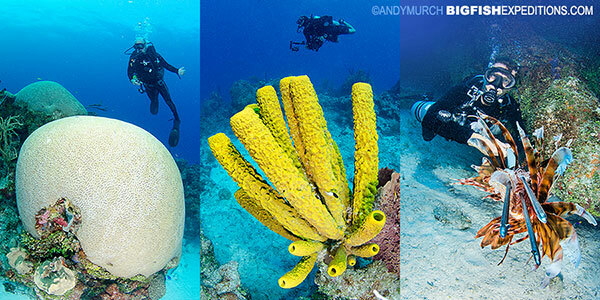 Each morning we would dive on one of the fringing reefs around the atoll. None of the reefs were particularly deep so the dives were long and productive. 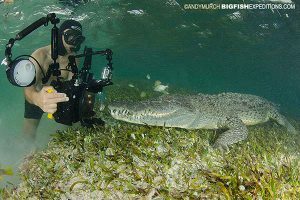 While we chased baracudas and nurse sharks or explored enormous sponges for macro life, our dive guides hunted in the crevices for invasive lionfish to feed to the crocs. As beautiful as lionfish are, because of their voracious appetites they are seriously impacting local reef fish populations so the daily lionfish cull is a great way to help protect the fish species that belong here. The crocodiles seemed extremely appreciative of the lionfish snacks that we tempted them with. 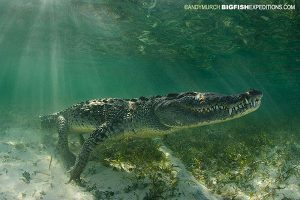 If only American crocodiles were comfortable in deeper water, perhaps they could deal with the invasive lionfish problem on their own. 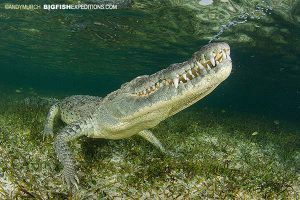 The croc encounters at Chinchorro take place in clear water just outside the lagoon. 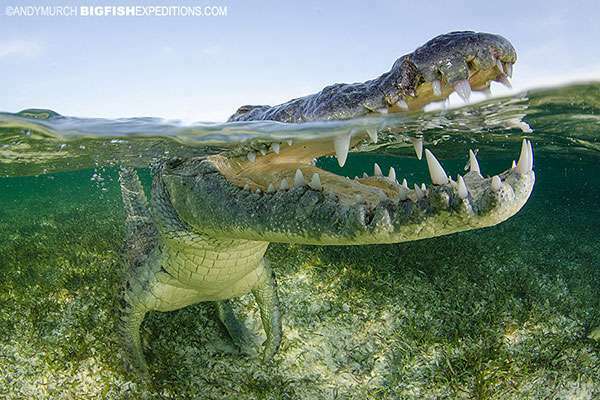 The boat crew entice the boldest crocodiles over to the Hotel Chinchorro which sits in about 4ft/1.2m of water. 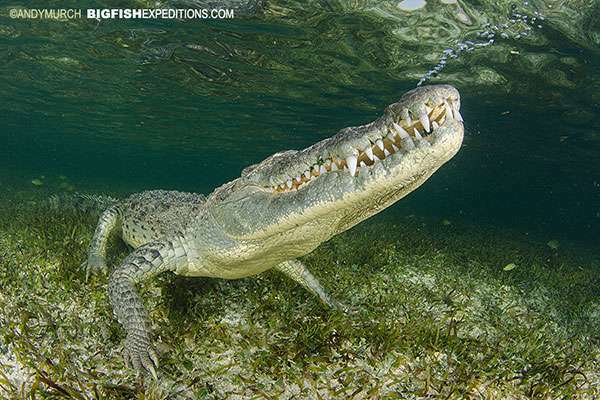 The crocs prefer to be in very shallow water so they immediately make for an adjacent sea grass bed that is only 2ft/70cm deep. 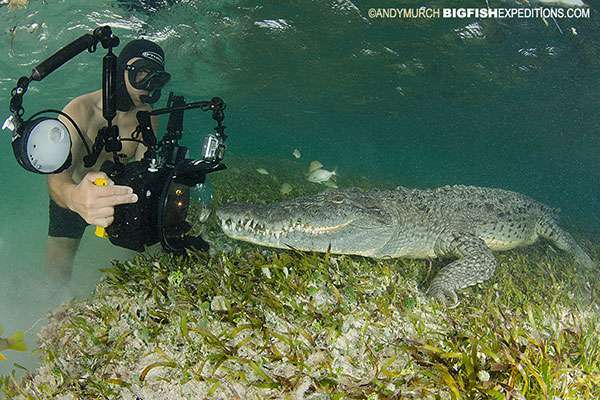 The divers position themselves on the sand right next to the shallow sea grass bed where the crocs are waiting. It is a perfect viewing area that offers extremely close contact while maintaining a level of safety. Just in case, there is always a safety diver present with a pole to ward off any advances from over enthusiastic crocodiles but the crocs are generally extremely well behaved both below and above the water line. Crocs are not early risers. Being cold-blooded, they need a few hours of sunshine to warm their muscles before they are ready to swim out to the hut, so we had ample opportunity to explore the atoll after our early morning dives. One morning we visited the ranger station in the middle of the atoll. 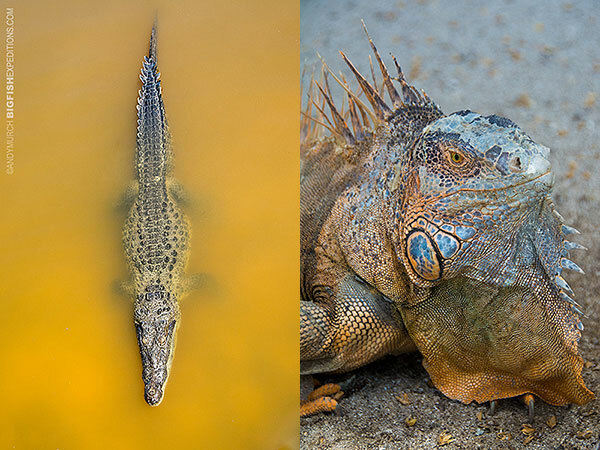 It was a great place to take some aerial shots of the crocs in the lagoon and to shoot some images of the orange iguanas that are endemic to Chinchorro. 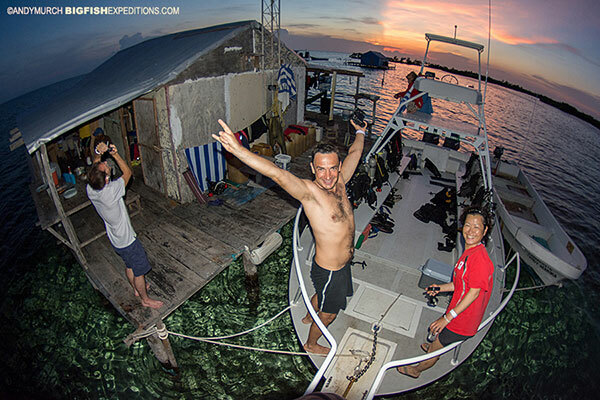 On our last morning we dove on one of many wrecks that litter the reefs around Chinchorro. The Gingersku was laden with a heavy cargo when it broke its back on the eastern slopes of the atoll. 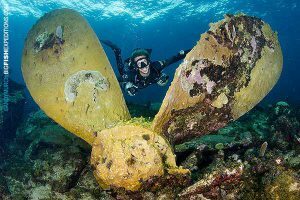 Now in many pieces, the remains of the hapless vessel are completely encrusted in corals and are home to thousands of grunts and snappers. 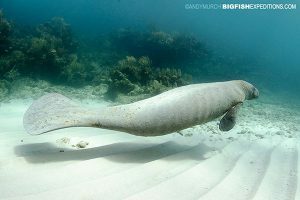 During our last dip with the crocs, we managed to position one against the dying rays of the afternoon sun for some beautiful sun-splash shots. There are virtually endless possibilities with these remarkable animals and as I browse through hundreds of images from this year’s encounters, I can’t help thinking that many more opportunities await next year’s adventurous guests that visit Chinchorro!